43 year old female is brought into your resuscitation bay by the paramedics. She has a 2 day history of vomiting and diarrhoea on the background of type 2 diabetes and alcohol abuse. Her son is concerned that she has become increasingly confused despite drinking her usual amount of alcohol. As she passes by you notice that she is agitated, appears clinically dry and has some black discolouration around her mouth which her son believes to be red wine. There are no family or friends available to provide a collateral history, however the paramedics inform you that she has a history of chronic right upper quadrant pain for which she takes regular codeine. She does not appear to currently be in pain, but complains of nausea. She has multiple drug allergies including: penicillins, cephalosporins and metronidazole. The severity of these allergic responses is unclear. tachypnoeic with no other chest signs. abdomen soft with RUQ tenderness. no evidence of an peritonism. mild pitting oedema to the ankles. moving all four limbs with good strength – no obvious focal neurological deficit. DDx – fever, pain, salicylate toxicity, VQ mismatch etc.. 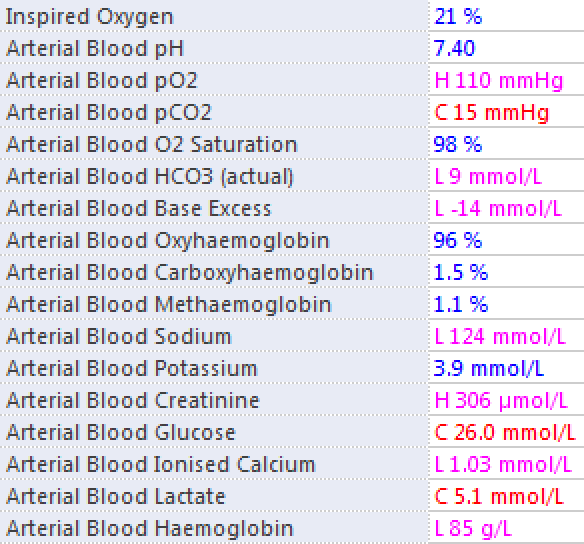 Severe high-anion gap metabolic acidosis with a concomitant respiratory alkalosis and an associated hyperglycaemia, hyponatraemia and mild anaemia. Likely secondary to sepsis and associated acute kidney injury. What are your differential diagnoses in this case? NB. Calculated osmolality = 296, ∴ no significant osmolar gap. Macrocytosis (MCV 105) suggestive of chronic alcohol excess, however consider B12 or folate deficiency. 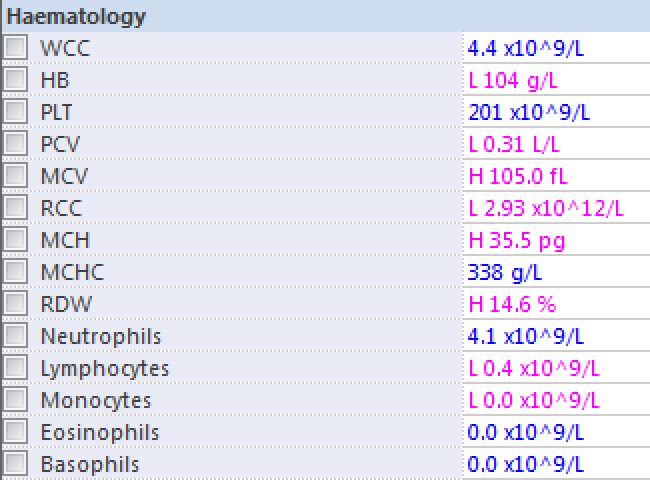 Normal WCC with mild lymphopenia. Elevated INR without anticoagulation therapy. Suggestive of mild liver disease or early coagulopathy from sepsis. What are your initial resuscitative goals? Aim for lactate clearance (>10% per hour), improved skin perfusion & normalisation of pulse/blood pressure. 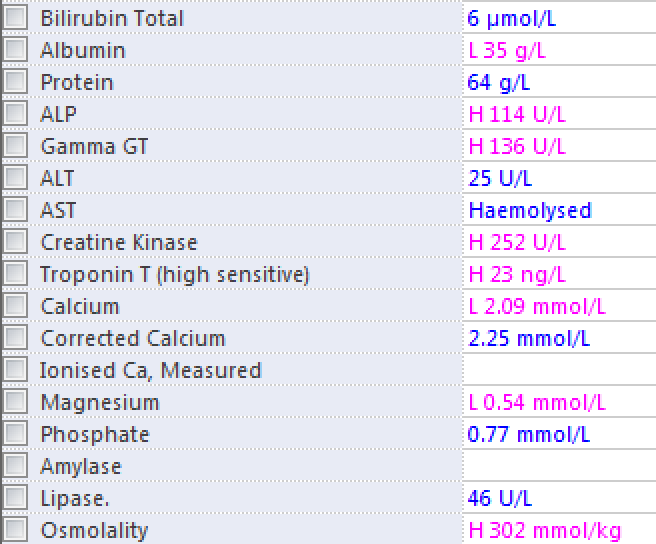 Aim for urine output of 0.5-1 mL/kg/hr. Further imaging requested: CT Brain plus CT abdomen/pelvis. An indwelling catheter is placed and a small amount of cloudy urine is collected. Urinalysis demonstrates moderate blood, moderate leukocyte esterase but negative nitrites. After initial resuscitation, she remains haemodynamically stable and appears to be slightly less confused, however during the wait for further imaging her blood pressure drops to 70/51 which is no longer responsive to fluid administration. Peripheral inotropes are started whilst central access is obtained under gentle sedation. There is a markedly abnormal appearance of the right kidney. There are extensive bubbly and linear streaks of gas throughout the majority of the renal parenchyma. There is also significant right peri-renal and peri-ureteric stranding. No definite collections can be appreciated on this non-contrast scan. No definite renal calculi are seen. Appearances are consistent with extensive right emphysematous pyelonephritis which is thought to be Type I due to the extensive parenchymal involvement. Emphysematous pyelonephritis is a necrotising, gas-producing infection of the kidney. The common instigators are E. coli, Klebsiella pneumoniae and Proteus mirabilis. The pathogenesis is poorly understood, but elevated tissue glucose levels are thought to promote a favourable environment for gas-forming microorganisms. Clinical features resemble those of acute, severe pyelonephritis. Thrombocytopenia, acute kidney injury, disturbance of consciousness or septic shock are commonly seen. CT is the most definitive modality for diagnosis. Contrast-enhanced CT is preferable, but may not be possible due to renal impairment. 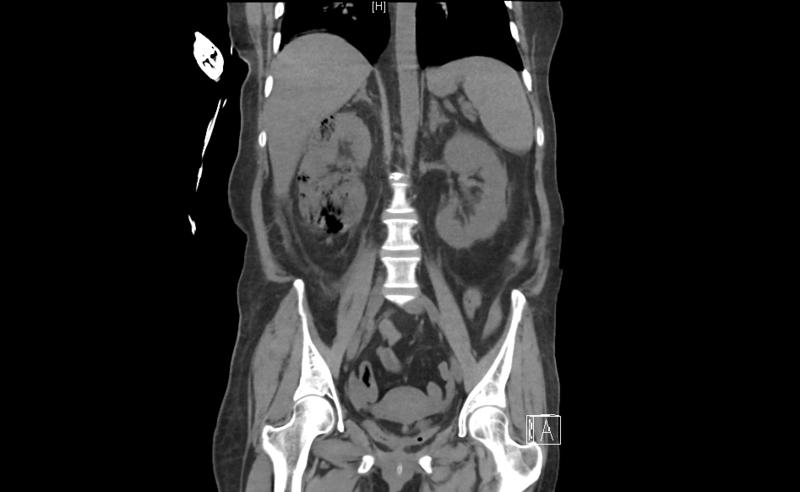 Emphysematous pyelonephritis can be categorised via two radiological classification systems. Acute kidney injury, altered mental status and severe hyponatraemia are all significantly associated with mortality. Treatment is fast becoming increasingly conservative. Systemic antibiotics are the mainstay of management, in addition to percutaneous catheter drainage (PCD) or stenting to relieve any urinary tract obstruction. Patients who either have severe radiological disease (class 3A or 3B) or multiple organ dysfunction have been shown to have better outcomes with nephrectomy. If PCD is unsuccessful, nephrectomy is indicated. You call the urology team who take the patient to the theatre for an emergency right-sided nephrectomy. Given her complex medication allergies, Infectious Diseases are consulted who advise clindamycin and ciprofloxacin for ongoing antimicrobial coverage. This is later changed to meropenem. She remains in intensive care for 48 hours post-op for inotropic support, following which she makes a progressive & uneventful recovery. Very well written Ming. Keep up the good work.